The charm of the rustic French countryside comes alive. Vintage accents, uncompromised craftsmanship, and classic-yet-comfortable lines work together with inspired from with the solid wood Amish Solid Wood Provence Bar Stool. All Amish furniture included in the Keystone Collection comes with a 25 year warranty! During American’s Gilded Age, the tycoons who amassed vast fortunes from industries like railroading, oil and banking build grand mansions on magnificent estates, some rivaling European castles. No expense was spared, no detail overlooked. Furniture almost as impressive as the architecture filled the rooms. Inspired by the last 19th Century wonders, the Provence style would be at home wherever unambiguous statements were valued. Anchored in a rich design heritage, though distinct updating for 21st Century preferences. The overall feel is light, less formal, more comfortable with detailing choices to accent the classic or the contemporary. Consider our Provence Table to match this barstool! 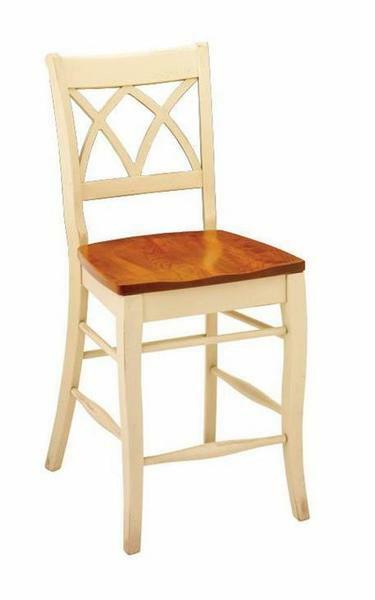 Shown in Cherry Wood with Parchment Paint, Woodberry Stain and Legacy Finish Package. Chairs Not Included in Price.